Note: if this page does not load the background or graphics properly, click here. Get ready in 2005 for the Adel reunion cruise! Visit the Adel "Wall of Fame"
Not sure who they are. None have responded to emails. But as the photo below shows, the purple and gold is back at the GCC campus. Found This web page from the new Adels. I have some problems with the "Adel Devotions" page. 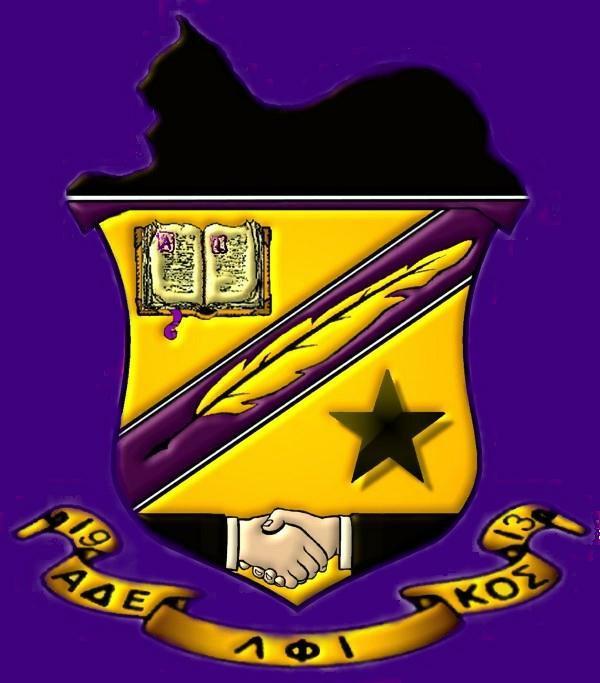 During the late 1960's I pledged the Adelphikos Fraternity at Grove City College, thus introducing me to a number of friends with whom I would remain in contact for years. 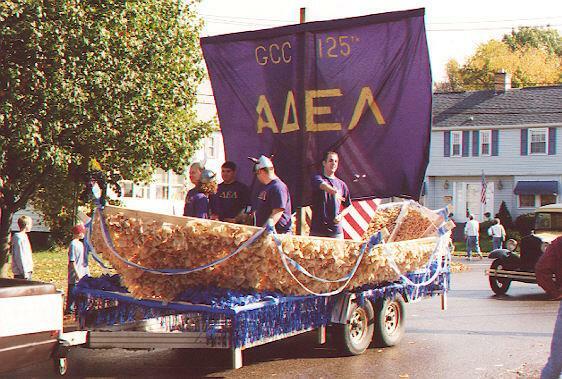 Those days were wonderful, and the Adelphikos (the college's second oldest) was a frequent winner of the float contest held during the homecoming ceremonies. or contact one of the members directly by email them using the "Adels on the Internet List" toward the bottom of this page. This is the dormatory that the housed the Adels in the late 1960's. 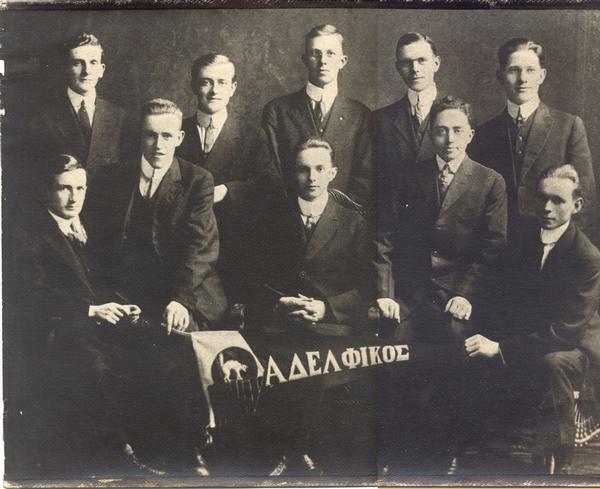 During the late 1960's, the Adelphikos Fraternity became on of the most active and interesting social groups on the Grove City College Campus. in 1967, the fraternity created a float to commemorate the Pink Panther movies, and the float won first prize. This was the first time the Adels had won the float contest since 1963. In 1969, a large float showing and Eagle with an American flag in its beak and landing on the moon "The Eagle has Landed". Homecoming 1970 made it three years in a row with first place winner with Tony the Tiger. 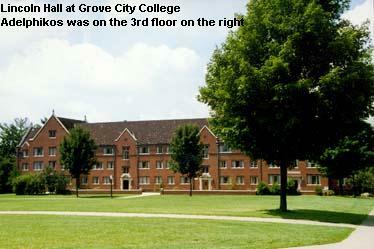 *Claude died of AIDS in the winter of 1996 as noted in the Grove City College Alumni News. He had resided in Atlanta, Georgia during his last years. During my years at Grove City College, the President was J. Stanley Harker and the Dean of Men was Dr. Fred Kring (wonderful guy and a good friend. Dr. Fred who always wore red, died in 1995.) Dr. Sweezy was the dean of the college. The 1960's were trubulent years on most college campuses. Grove City was no exception. Although there were no riots nor were any students killed as happened at Kent State University in Ohio, there were demonstrations and speeches. Much of the social and political change was quietly expressed through the college newspaper, The Collegian. I served as an editor and as cartoonist from 1968 through 1970. I even received an award from St. Bonaventure University for a series of cartoons I did during the Nixon Administration's handling of the War in Viet Nam. Most of our activity in the Adelhpikos Fraternity, however, revolved around what parties we were going to schedule and "road trips" to the Lone Pine Inn west of Grove City on Rt. 208 or Herron's Bar in Sandy Lake. As I recall, we had many road trips. On a May evening in 1970 on the road to Sandy Lake, two Grovers were killed when the car in which they were riding struck a utility pole and hurled them into a tree. (No seatbelts and it was a convertable.) Both men were about to graduate and one was to get married in June of that year. They were not Adels. Steve Livingston was a Nu Lam and Dave McCleod was a Beta Sig. But they were good friends of ours, especially Dave. And this incident perhaps forewhadowed the accident that occurred in 1974 when several Adels were killed by a drunk driver during a pledge walk. It is hard to remember some of the events which occurred three decades ago, but I do remember that one of the founding Adels died while I was attending GCC in the 1960's, Ira Shaw. A group of us went to Pittsburgh to visit his surviving family. Still we raise our banner high. *Deceased - Claude Grady died of complications related to HIV and AIDS. Special note:Adel Tom Abel was killed in a motorcycle accident. Ron Holstein is also deceased. Details unknown. 1967 was the Summer of Love year. Much was happening in the U.S and abroad at that time. The Ford Mustang had not been ruined yet; the top movie was "The Graduate"; The top album was "Sgt. Pepper's Lonely Hearts Club Band", and the Beatles reigned supreme in pop music; "Mission Impossible" was the top suspense show; Lyndon Johnson was President and had escalated the number of American troops to 550,000; the "new" Nixon was back and running for President; starting teachers' salaries were about $5,000 a year; a new home cost less than $20,000; the Dow Jones Industrial Average was around 800; Ohio State was building the best college football team ever; the Cleveland Indians were still in the cellar; Kenny Rogers and the First Edition had a hit called "I Just Dropped In to See What Condition My Condition Was In"; and the Adelphikos had their largest pledge class in four years. In those days there were ashtrays everywhere. It had not yet become politically incorrect to smoke. A gallon of gas was about 30 cents, but there were often price wars that lowered it to less than a quarter. Jay Curran still had his 1957 Chevy; Bill DeMore, his Corvair, Gary Brook, his 1960 Oldsmobile, Rick Wolfe, his 1958 Buick. Our greatest goals in life were to maintain at least a 2.0 average so that we could pledge, get dates, party, keep our 2S deferments, get a dummer job, take frequent trips to Youngstown, avoid the dining hall, get an apartment off-campus, party, get dates, go to Herron's, get dates, party. . . . Lots of things have changed since then. Some things haven't.